If you haven’t heard, humble cuts of meat are in. Once unpopular, these tough, fairly inexpensive cuts are now on the rise, making frequent appearances on restaurant menus and dinner tables everywhere. Short ribs, cut from the rib and plate primals of the steer, are a favorite in my house. Braising breaks down the tissues and tenderizes the beef, resulting in rich, meaty flavor. In my book, braising and wine go hand-in-hand, so I decided to pair some short ribs with a robust bottle of Zinfandel. The outcome was insanely delicious. 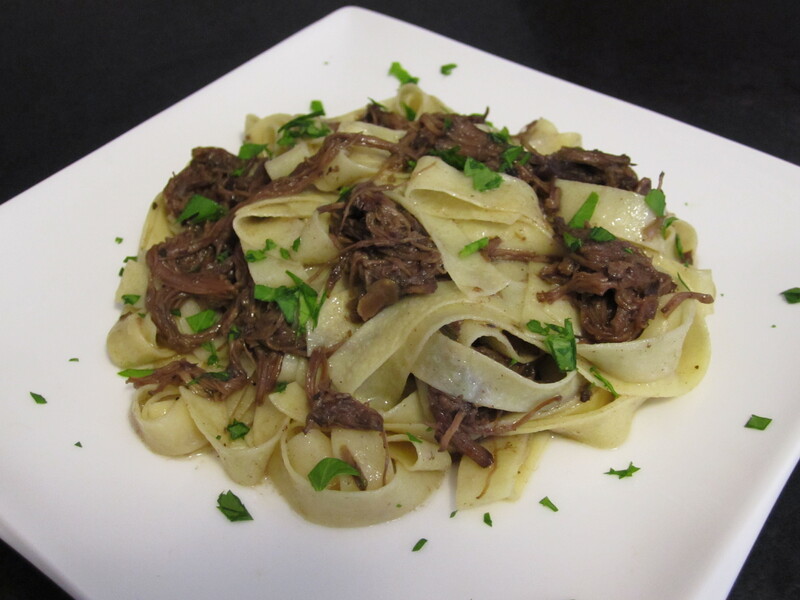 Shred the beef and serve over pasta for a meal guaranteed to impress. Pat the ribs dry and season liberally with salt and pepper. In a large Dutch oven, heat about two tablespoons of olive oil over medium-high heat. Brown the ribs on all sides, in batches, if necessary. If the olive oil gets soaked up between batches, add some more before searing the next batch of ribs. Once browned, remove the ribs to a plate. Add the onions to the pot and cook till tender, about 8 minutes. Add the garlic and cook an additional minute. Pour in some of the wine and scrape up the brown bits at the bottom of the pan using a wooden spoon. Pour in the remainder of the bottle of wine, then add the porcini mushrooms. Return the short ribs to the pot. Add enough beef stock to completely cover the ribs. Add the rosemary and thyme, then bring the mixture to a simmer. Cover the pot and transfer to the oven. Cook until the ribs are tender and falling off the bone, about 2.5 to 3 hours. Remove the ribs from the pot and set aside to cool. Using an immersion blender, blend the juices and vegetable until smooth. Season with salt and pepper, if needed. Bring the sauce to a simmer and reduce until thick, about 20 to 30 minutes. When the short ribs are cool enough to handle, remove the meat from the bones and shred. Return the beef to the pot with the reduced sauce. At this point, the ragu can be cooled and stored in the refrigerator for the following day. This will allow the flavors to fully develop. This is a great make-ahead dish! When you’re ready to put the meal together, re-heat the ragu. Fill a large pot with water and season generously with salt. Bring to a boil. Stir in pasta and cook until al dente. Drain pasta and combine with short rib ragu. Serve with a sprinkle of fresh parsley. Enjoy! This entry was posted in Beef, Braise, Comfort Food, Dinner and tagged Beef, Braise, Pappardelle, Ragu, Short Ribs, Zinfindel. Bookmark the permalink.